The 1850s were a devastating time for California Indians, as swarms of contentious and tough miners poured into their homelands. The Indians were often ruthlessly slaughtered or enslaved, and the federal government, which had won California in the Mexican War, failed to provide them with any protection. 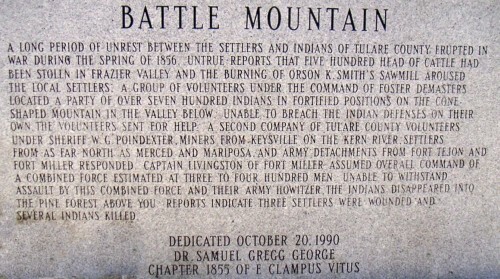 In 1851, Governor Peter Burnett said that unless the Indians were sent east of the Sierras, a war of extermination would continue to be waged until the Indian race should become extinct. During the tumultuous 50s, the Yokuts of central California made a courageous attempt to defend themselves against an invasion of their lands  and, for a length of time, succeeded. 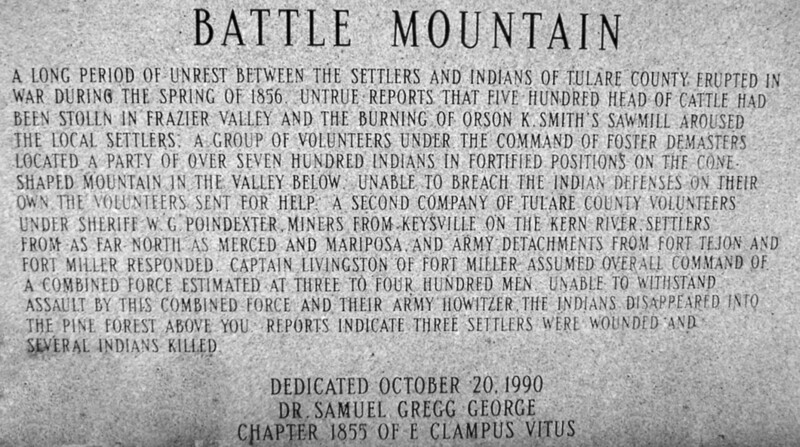 On a hilltop located just to the east of present-day Porterville, Calif., a siege occurred in 1856  at what is now known as Battle Mountain  during a confrontation that the newspapers of the time referred to as the Tule River War. The Yokuts  that is, the people loosely grouped together as speakers of the Yokuts language  lived in small bands amid the oak-studded foothills of the eastern San Joaquin Valley. Many of their villages lay near the shoreline of Tulare Lake (sometimes called Tule Lake), a body of water 60 miles across. Today, water diversion projects have left no trace of middle Californias watery past, but in the 1850s, Tulare Lake was the largest body of fresh water west of the Great Lakes. When the Spanish first settled California, there were more than 20,000 Indians living in and around the Tulare Valley. Along with the Yokuts were a significant number of coastal Indians who had fled from the missions into the interior valley. Making good use of stolen horses, the Yokuts had become deft raiders of livestock from missions and sprawling rancheros near Los Angeles, Santa Barbara, San Jose, San Fernando and San Luis Obispo. They saw the newcomers who arrived during the California Gold Rush as a threat. One miner wrote a letter to the Cleveland Plain Dealer in August 1849, mentioning that there was an abundance of gold on the Kings River but that the Indians were so hostile, that those [prospectors] who attempted to work there were driven out. Pressured to find a means of ending the violence, federal treaty commissioners met with the Gawia and Nutunutu bands of Yokuts. The Indians agreed to abandon any claims to the area around Four Creeks and to live in peace. In exchange, the government agreed to provide them with a reservation, as well as with protection, livestock and clothing. On May 12, 1851, a treaty was signed at John Woods gravesite  an irony not lost on at least one journalist: Here over the graves of our murdered companions have the soft hands of the Commissioners grasped in friendship those of the incendiary and murderers of our people.In all, 18 treaties were negotiated with California tribes in just 16 months. Although the Yokuts lost most of their lands in the treaties, the editor of the Los Angeles Star reacted unfavorably: To place upon our most fertile soil the most degraded race of aboriginals upon the North American continent, to invest them with the rights of sovereignty, and to teach them that they are to be treated as powerful and independent nations, is planting the seeds of future disaster and ruin. Led by Walter Harvey, a Georgian who had been dismissed from West Point on demerits, the two-dozen miners rode quickly to the Choinimni village on the Kings River in early July. Many of the younger men of the village were off working in the fields, but the miners demanded the arrest of three Yokuts who were there. When the accused Indians attempted to flee, Campbell fired the first shot. Others followed suit. The violence left 11 Yokuts dead and one miner wounded. Two weeks later, Harvey  now famed throughout the valley as an Indian fighter  was elected county judge. News of the massacre spread fast, and most Yokuts feared that the whites meant to kill all of them. The Fort Miller commander, Brevet Major George W. Patten, feared the outbreak of war and asked James Savage, an Indian subagent, to do whatever he could to diffuse the tension. A self-made entrepreneur known as the White King of the Yokuts, Savage visited more than a dozen of the tribelets and urged them to remain at peace until they had a chance to meet with Major Patten on August 15. On his way to that meeting, Savage stopped by Campbells trading post and encountered Judge Harvey. He accused Harvey of murdering the Yokuts, and a lively fistfight ensued. While bystanders attempted to break up the fight, Harvey coolly drew his pistol from his belt and killed Savage. With the one white man who might have brought peace to the region dead, Patten was left on his own to answer the pleas of the Yokut leaders. What shall we do? Chief Pasqual wanted to know. To whom shall we go, when in the mountains we are hunted like wild beasts; and here we are shot down like cattle? Patten, unaware that the Senate had voted down the treaties, assured Pasqual and the other leaders that their treaty rights would be protected and that he would investigate the attack on Wa-ta-kas band. In exchange, the Yokuts agreed not to take any retaliatory actions, to cease stealing cattle, and to return to their villages. Patten promptly arrested Harvey, but the judge had friends in high places. Governor John Bigler wrote to the major, telling him that the Army lacked jurisdiction to arrest civilians. When the U.S. attorney in San Francisco refused to file federal charges, Patten had no choice but to set Harvey free. Later, state authorities charged Harvey with the murder of Savage, but the celebrated Indian fighter was acquitted. Patten wrote to Army headquarters on August 26, warning that if the May 12 treaty was not ratified it would amount to a mere farce, which requires but the lifting of the curtain to turn into a grand tragedy. Meanwhile, the citizens of the Four Creeks area petitioned General Ethan Allen Hitchcock of the Armys Pacific Division to establish a fort closer to them. Frustrated by the failure of Congress to ratify the treaties, the Indian Office decided to place some of the Yokuts and other valley Indians on a reservation. Edward F. (Ned) Beale, a hero of the Mexican-American War, was appointed Indian agent for California. He quickly sized up the condition of Californias Indians: Driven from their fishing and hunting grounds, hunted themselves like wild beasts, lassoed, and torn from homes made miserable by want, and forced into slavery, the wretched remnant which escapes starvation on the one hand, and the relentless whites on the other, only do so to rot and die of a loathsome disease, the penalty of Indian association with frontier civilization. By the fall of 1852, Beale had selected a semiarid plot of land at the base of Tejon Pass as the site of the reservation, soon to be known as the Sebastian Reserve. For the first few years, more than enough food was grown thereto feed the Indians. To further ensure calm, the Army placed detachments of soldiers at the reservation and at Camp Wessells, which was established near the old cabin of John Wood at Four Creeks. On New Years Eve 1853, the company commander, Lieutenant John Nugen, reported that the Yokuts had kept their part of the bargain and were at peace. Nugen did note, however, that great numbers of these people had been dying lately due to fevers and malaria. In August 1854, the Army established Fort Tejon, a permanent post in nearby Grapevine Pass, and garrisoned it with a company of the 1st Dragoons. In 1855, Captain E.D. Townsend passed through Four Creeks while on an inspection tour of Forts Tejon and Miller. He noted in his journal: The woods are full of Indians who live on the acorns abounding here, and on fish which they take from the river with spears. They are peaceful and seldom give the settlers any trouble. Townsend further wrote that the Indians were regularly employed by the settlers, and, as far as he could tell, there seems to be no sign of animosity between the two races. This lull in the violence was only a superficial peace. In 1855, bits of gold were found along the banks of the Kern River, and miners flooded into that area. Sizable herds of cattle and hogs now grazed upon the Yokuts traditional means of subsistence  roots and acorns. As these sources of food became depleted, the Yokuts, many now near starvation, began to pilfer stock. In 1856, a mysterious fire destroyed Orson Smiths sawmill, and a large cattle herd was stolen  setting in motion the grand tragedy that Major Patten had predicted. Without investigating the incidents, several dozen settlers, calling themselves the Tulare Mounted Volunteers, took to the field. An advance party, under the command of John W. Williams, ambushed a sleeping village of Tejon Indians, killing five. Another group fired shots into an unarmed camp of Yokuts on the Kaweah River and scattered its inhabitants into the night. J. Ross Browne, a special agent for the Treasury Department who was traveling through Visalia at the time, wrote of the escalating events: Fifteen Valley Indians were killed within a few miles of our camp and the white families have sought refuge in a mill at Visalia whilst the men are preparing for a vigorous defense. It is impossible to predict what the result will be, but I fear from the lawless character of the white settlers and their determination to have a war and exterminate the Indians that there will be much trouble and the prosperity of the Indian reservations will be greatly impeded. Fearing vengeful attacks by the settlers, most of the Yokuts went into hiding  some concealed themselves in the dense tule marshes, a few were given refuge by sympathetic settlers in Visalia, while others headed into the Sierras. About 400 Yokuts were not about to move. They located their village behind a natural bulwark of rock and timber at the base of a small mountain on the North Fork of the Tule River and waited to defendthemselves with bows and arrows and a few flintlock pistols. On April 28, 1856, Foster DeMasters band of more than 100 would-be Indian fighters stumbled upon the mountain camp. As the volunteers emerged from the thicket and onto the open meadow, they were met with a volley of arrows that forced them back into the bush. The Yokuts charged from behind their fortification. Had they possessed better weapons, they surely would have swept the militiamen from the field; with what they had, the Yokuts inflicted serious wounds on two of DeMasters men. The volunteers decided to wait for Sheriff W.G. Poindexters company, which was on its way from Keyesville. Poindexters men arrived on the 29th. Some of them had devised a body armor, consisting of cotton padding and canvas tarps, that they thought was impervious to arrows. Thus armored, they boldly charged the Indians fortification. The body armor, however, provided no protection, and a mass of arrows turned back the assault. A Stockton newspaper quipped, The Petticoat Rangers were upon the field, but effected nothing, as their padded garments only served the purpose of sleepingaccommodations. With ammunition running low and their taste for war and glory now soured, the chastened volunteers quit the field and returned to Visalia. .We will defend ourselves if they make an appearance. The citizens of Los Angeles decided at a town meeting that the miners of Keyesville were perfectly able to defend themselves. Several miles to the north, across the Greenhorn Mountains, Lieutenant Livingstons footsore artillerymen were attempting to haul a field gun to bear on the Yokuts hilltop position. Under a hot May sun, the troopers hacked, shoved and swore as they inched the 2,000-pound cannon along the rocky banks of the Tule River and up into the hills. The craggy terrain and thick brush soon proved impassable. Livingston decided to breach the fortification without the aid of his cannon. In the pre-dawn of May 13, 1856, Livingston climbed a nearby hillside and peered into the Yokuts encampment. Seeing the position was not heavily defended and could be attacked on its flank, Livingston swiftly put his company into motion. The artillerists carried cumbersome .69-caliber Model 1842 smoothbore muskets that became entangled with low branches and literally slowed the advance to a crawl. Suddenly, a group of Yokuts rose from the underbrush and peppered the detachment with arrows. Most of the arrows were deflected by the bushes, however, and they caused no serious injury to the troops. Without hesitation Livingstons men leveled their muskets, loaded with buckshot and ball, and returned fire, taking a deadly toll upon the defenders. Livingston shouted: Charge! Bayonets, forward! as the Yokuts hastily melted into the safety of the dense pine forests of the Sierras. Livingston reported 20 dead tribesmen, and other Yokuts would later die of wounds received in the battle. The emboldened volunteers, following in the wake of the Regulars, looted and burned the Yokuts village. The destruction of the encampment (on the unnamed hill that would be called Battle Mountain), however, triggered a new round of violence. Mounted tribesmen raided outlying ranches and mines, burning a dozen abandoned buildings, stealing livestock and killing at least one herdsman. Brevet Major General John E. Wool, head of the Department of the Pacific, ordered his troops in the area to protect the inhabitants from Indian depredationsand, if possible, preserve the peace. On June 5, the 1st Dragoons, temporarily under the command of Sergeant Walton, headed back to their quarters. The sole army fatality occurred on this day when trooper Richard Thorpe fell from his horse and drowned while crossing the river at Four Creeks. Summing up the war, John Gardiner, captain of Company A, wrote: Our Indian war is over for the present, and I do not think will be revived unless the whites commit more murders. The Indians look to us as their protectors. The stories that I have heard of the outrages perpetrated by the whites would be incredible were they not well vouched for. The Indians are naturallyquiet and would continue so if left alone. Ironically, the Indian subagent at Kings River Farm was William Campbell, who had moved onto Yokuts land in 1852 and had participated in the destruction of Wa-ta-s village. Although Campbell knew of the impending raids, he did not notify the military, nor did he request protection for his wards. His former trading post business partner, John Poole, proudly wrote to the Sacramento Union that these pesky Indians were driven to the mountains and are not to be permitted to return, even if they showed an inclination to do so. .Theacts of the whites so far seem to me to be utterly lawless. Those owning stock on Kings River allow the stock to feed upon the Indians acorns, and some even say, assist them to them. Livingston concluded that, as agent, Campbell never fed or attended to one tenth part of the Indians here. Eramus Keyes, a captain of the 3rd Artillery who had escorted the federal treaty commissioners in 1851, had been impressed with the physical appearance and bearing of the Yokuts. When he returned to Fort Miller in 1858, Keyes wrote that he was shocked with the spectacle of degradation and self-abandonment they presented. In November 1858, an armed band of citizens from Visalia removed some 200 destitute Yokuts from villages on the shores of Tulare Lake and from Kings River Farm and brought them to Fresno Farm, a reservation on the Fresno River. By that time, the Sebastian Reserve was in serious decay and rocked by scandals. It is not possible to determine how many Yokuts died of disease and exposure while living on the reservations or in exile deep within the snowbound Sierras. Suffice it to say, there were 14,000 Yokuts at the time that gold was first discovered in California; by 1870, fewer than 1,000 Yokuts remained. Lieutenant Benjamin Allston decided that soldiering in California was not his cup of tea. In 1857, after his fathers election as governor of South Carolina, he resigned his commission. Four years later, Allston became a cavalry general for the Confederacy. Larhett Livingston commanded a brigade of Union artillery in the Army of the Potomac and, after the war, became the colonel of the 3rd Artillery. In 1861, Benjamin Beall, having honorably served in the Army since 1836, retired from active command because of declining health. Major George Patten also fought for the Union, but later traded his sword for a pen and became a noted poet in San Francisco. Louis Walton, the man who had lifted the siege of Keyesville, lost his sergeants stripes a few months after the end of the Tule River War. He was discharged from the 1st Dragoons on November 21, 1858. William Campbell, notwithstanding accusations made by a federal investigator concerning his fraudulent practices as an Indian agent, became a county supervisor. Walter Harvey, fearful of vengeance, left the valley and obtained governmental posts in Sacramento and San Francisco. Ned Beale acquired vast tracks of real estate in the valley  including the Tejon Ranch and the land that the Sebastian Reserve had once occupied. Fort Miller was abandoned by the Army in 1858. Although briefly placed back in use by California troops during the Civil War, it now lies on the muddy bottom of Millerton Lake  a body of water formed after the construction of the Friant Dam in 1959 blocked the flow of the San Joaquin River. The Chunuts were a band of Yokuts forced from their homes on the shores of Tulare Lake. In 1933, Yoimut, an 85-year old Chunut woman, told historian Frank Latta that she was the last survivor of her band: "All of my life I want back our good home on Tulare Lake. But I guess I can never have it. I am a very old Chunut now and I guess I can never see the old days." This article originally appeared in the June 1999 issue of Wild West.